The Platinum series rods are produced in the U.S.A., and, being in a class all their own, they’ll stand out against any other rods on the market. Blessed with blanks constructed from a unique blend of high modulus graphite and an all carbon scrim, Beulah Platinum rods are light in the hand, powerful, and they cast better than rods selling for twice their price. Each rod within the series is tailored to the specific application for that rod, from a 3 weight that delivers a superbly delicate presentation to a 9’ 9” 7 weight that will go the distance in the wind. All Platinum Series rods are classically appointed with four color thread wraps, custom nickel silver hardware with Maple burl reel-seats (3-5 wt. rods), black anodized, double locking reel seat (6-7 wt. rods), high quality stripping guide / chrome over stainless steel snake guides, and hand selected Portuguese cork burls. All Platinum single hand fly rods come complete with a partitioned rod sock, Cordura covered protective tube, and a lifetime warranty. Platinum 8’ 3wt 4 pc 2.7oz. This fly rod is designed for use on spring creeks, high mountain lakes, small freestone streams, and will be excellent to use for small to medium size trout and pan fish using a variety of fishing methods such as dry flies, wet flies or weighted nymphs. The rod has a classic medium action with fast recovery, and is an excellent rod for delicate presentations close in or can be double hauled over 60’. We recommend an Airflo Super-Dri Elite 3wt, Cortland 444 Classic 3wt, or 444 Classic Sylk 3wt line for this rod—D.T. or W.F. Platinum 8’8″4wt. 4 pc 3.1 oz. This very well may be the most coveted Platinum single hand rod made by Beulah, and, by extension, anywhere else.The Platinum 8’8″ 4wt fly rod’s medium fast action loads crisp and quickly, and delivers flies from #22 Midges to #6 Golden Stones with ease. If you are searching for the perfect 4 weight, you’re search ends here. [Yes…it’s that good, and more. Jim]. The rod was designed for use on spring creeks, high mountain lakes or anywhere you see a trout rise, and will be excellent for use with small to medium size trout and pan fish using dry flies, wet flies, and weighted nymphs. We remcmmed an Airflo Super-Dri Elite 4wt, or a Cortland Platinum 4wt line for this rod. Platinum 9’ 5wt. 4 pc 3.2 oz. From casting small dry flies into pockets to swinging streamers, the Platinum 5 weight will do it all. Designed as a medium to large water rod, this fly rod will load in short but has the power to go long. The Beulah Platinum 5 weight is made for fishing, not winning the casting competition behind the shop…but it could. This rod was designed to be Beulah’s best all around trout rod, and its medium fast flex pattern will satisfy the most accomplished angler. This rod will also perform well catching anything from small and large mouth bass to a variety of trout and panfish, as well. We remcmmed either an Airflo Super-Dri Elite 5wt, or a Cortland Platinum 5wt line for this rod. Platinum 9’6” 6wt. 4 pc 4.0 oz. This rod gets It done: nymphing tandem rigs, fishing from a boat, float tubing lakes chasing trout, casting poppers for small and large mouth bass, swinging flies for Atlantics, even casting for schoolie stripers in salt water. From Alaska to Tierra Del Fuego dry fly or wet, overhead or spey this rod says “yes I can”. Used primarily for larger trout on big water, this rod has a fast action with a fast recovery, and is beautiful to cast and mends well with many modern, weight forward, long bellied or double taper lines. We recommend the Airflo Super-Dri Mend #6, or the Cortland Platinum #6 lines for this rod. Platinum 9’9” 7wt. 4 pc 4.1 oz. This extremely light and well-balanced rod is defined by its Smooth casting and exceptional tracking ability, traits that often allude most rods of its length and line weigh. This 7 weight has a quick yet slightly relaxed Med. fast feel while casting that’s designed to excel at swinging and nymphing for Steelhead and light Salmon, yet sill remain sharp enough to use for light saltwater excursions for Bonefish, Redfish, Snook, and Sea Trout. We recommend the Airflow Super-Dri Mend 7wt., or the Cortland Platinum 7wt. lines for this rod. Note: Beulah’s Platinum Spay and Switch rods; are also available. Beulah set out to make the best saltwater fly rod possible, and spared nothing to get it done. The result is the Beulah Opal fly rod, the next step in performance, strength, and sensitivity. Advances in graphite technology have allowed them to create lighter, smoother and more durable fly rods with a fast and responsive taper to help achieve quick, long, and accurate casts. With this increased strength, and exceptional tracking comes the confidence to do battle with the fish for which these rods were designed to engage. Opal saltwater fly rods are crafted from IM8 graphite combined with Nano Matrix Silica resin technology, and additionally feature solid titanium guides, a custom anodized aluminum reel seat with unidirectional locking ring, and AAAA quality cork grips (with extended “force grips” on 10 & 11 weight models). All Opal Saltwater rods come complete with a partitioned rod sock, Cordura covered protective tube, and a lifetime warranty. (Yes, we really like these rods, given their superb performance, and price that’s pile of dollars less then other “big name” Nano Matrix rods that don’t cast as smoothly, or as confidently as the Opal series of saltwater rods. ><<((((*>J). Opal Saltwater 9’ 8wt. 4 pc. 4.5 oz. This rod is light, responsive and laser accurate. The fast action blank flexes throughout the rod, and tracks beautifully for quick, delicate and accurate presentation. This fly rod is a true balanced 8 wt—not a 9 wt in 8 wt clothing—so there is no need to go up a line size to load it properly. The ultra-fast recovery keeps you locked and loaded for any shadows that might appear on the flats. Please contact us for specific line recommendations for this rod. Opal Saltwater 9’ 9wt. 4 pc. 4.9 oz. The Opal 9 wt is an extremely versatile saltwater fly rod for flats and beyond—perfect match up for permit, large bones, and striped bass. This fly rod has the sensitivity and accuracy of an 8 wt with the fighting power and casting potential of a 10 wt. Th e Opal 9 wt fly rod is perfectly balanced for 9wt floating / intermediate lines, light in hand, with durability and impact strength built in. Please contact us for specific line recommendations for this rod. Opal Saltwater 9’ 10wt. 4 pc. 5.2 oz. The Opal 10 wt. is the perfect combination of power and finesse. As with all Opal Saltwater rods, the Opal 10 wt casts with incredible smoothness, and this rod is already in the record books with Margaret Shaughnessy’s 80 plus pound roosterfish. Rod, fish and angler battled for 3 hrs. 45 minutes, and all lived to see another day. This rod balance nicely with a 10 wt. floating or intermediate lines, and 300-400 gr. sinking lines. Please contact us for specific line recommendations for this rod. Opal Saltwater 9’ 11wt. 4 pc. 5.4 oz. The Opal 11 wt fly rod is amazingly accurate, quick, and powerful—three necessary ingredients when fly-fishing flats and blue water. This fast action fly rod casts with soul, and has reserves of lifting power. You will feel the line load throughout the blank and recover in an instant. This rod balances well with an 11 wt. floating or intermediate line, or a 400-500 gr. Sinking line. Please contact us for specific line recommendations for this rod. Diamondback Flawless Rods are a new and exciting generation of rods offering the lightest physical weight, highest performance and greatest value rods we�ve ever offered. The trout models offer a perfect blend of speed, delicacy and control that the true trout aficionado understands and appreciates. The mid and heavy weight actions spawned a high test performance series designed for casters who understand the higher line speed characteristics of these rods and can put to good use their astounding firepower. The new Flawless saltwater rods are designed to tame big wind and wrong-headed saltwater speedsters that are used to having everything their own way. All Flawless 4pc. rods are light in the hand, sleek in profile and set a new benchmark for performance, cosmetics and value for fly fishers who require a faster action fly rod. The freshwater line weights 2 through 6 feature lustrous black hardware, burled wood reel seat spacers and western style cork grips. 7 through 12 weights feature black hardware, all aluminum reel seats and full wells style cork grips. What a wand! Trico�s and Midges are a specialty for this rod. Excellent up to 50� for ease of casting and supreme accuracy. A sniper at 55ft or closer with the accuracy of a surgeon. Great with any presentation that�s typically delivered with a 4wt line. With more than 50 years experience crafting fine split-cane fly rods, with famous customers like singer Bing Crosby and President Dwight D. Eisenhower (as well as a multitude of lesser known “brothers of the angle”) who appreciated fine craftsmanship and how it could enhance their fly-fishing experience, rod builder extraordinaire Walton Powell created the evolutionary Hexagraph fly-rod. 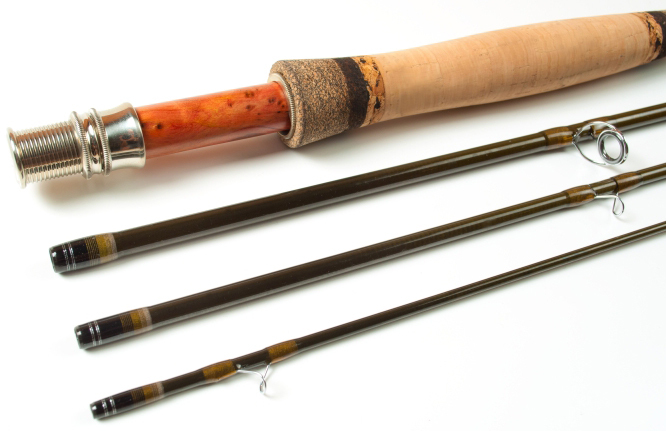 Featured exclusively in the film version of A River Runs Through it, all Hexagraph rods duplicate the appearance and actions of fine, custom-built, split-cane fly rods, assembled by gluing six tapered sections together to form a solid rod-blank with the distinctive hexagonal cross-section of traditional split-cane fly rods. The Hexagraph difference is that the material used is not aged Tonkin Cane, but primarily carbon-graphite, which makes the rods lighter, dramatically more durable, and about 20-30 % the cost of a quality split-cane fly rod. Since the rod’s cross-section is solid, not tubular, it won’t oval when bent (loose power), and since the rod’s guides are placed on a flat surface, the directional “roll-off” common to tubular rod blanks is eliminated. The foregoing, along with he full-flexing actions with variable loading points, allow the Hexagraph rod to cast at least two adjacent line weights, as well as exhibit the accuracy of a sniper riffle. The feeling one get fishing a Hexagraph is definitely pastoral, at one with the environment—not fighting it. We, also, know these rods to be “lucky” (so don’t take advantage of the fish, release them). The rods offered below are our custom versions of the Hexagraph rods, and feature slightly “tweaked” actions, custom fitted Super-Swiss nickel-silver ferrules, custom shaped premium cork grips, reel-seats with premium wood inserts, lightweight stainless-steel guides, and a life-time warranty. All rods are 2-pice, and are furnished with a high quality rod-bag, and a black aluminum rod-tube with brass cap. While we try to keep at least one or two of each rod in stock, they’re essentially custom built for us, and it can take 4-6 weeks for us to replenish out of stock rods. Call for availability, or to reserve a rod being built. A perfect “all-round” medium (cane rod) action rod for small to medium trout streams, with the delicacy to fish sub size 20 flies, and the power to throw a more substantial nymph or streamer beyond 60 feet, if the necessity arises. Like the 3 / 4 rod listed above, this rod is aesthetically compelling, with its nickel-silver cap and band reel-seat with premium walnut spacer, reversed Half-Wells premium grade cork grip, and chestnut wraps. We recommend the Cortland 444 Classic or Cortland 444 Sylk lines for use with this rod—double taper or weight forward. (We prefer using DT-4f, and a WF-5f Classic or Sylk lines with this rod). $850 w / Burled Walnut spacer. Please call for availability. The quintessential Western Trout rod for medium to large lakes and streams, capable of presenting small midges on 6 X tippets, as well as powering size 6 streamers and nymphs beyond 70 feet when required. This rod is our choice when float-tubing lakes, and, given its full-flexing medium- fast (cane rod) action, line-slap on the back-cast becomes somebody else’s problem. This rod is beautifully appointed with an up-locking, reel-seat with solid Burled Walnut spacer, a premium grade Full-Wells cork grip, and cinnamon wraps. We recommend the Cortland 444 Classic lines for use with this rod—double taper or weight forward (We prefer using DT-5f, and a WF-6f Classic lines with this rod). Please call for availability. A powerhouse of a big water medium-fast (cane action) Trout, Atlantic Salmon, and small-mouth bass rod, with the beef to throw a full line, yet still retain the delicacy protect a 4x tippet when required. But, the rod’s forte is throwing larger floating and sub-surface flies to big fish on large, often windy, streams. This rod is tastefully appointed with an up-locking anodized Aluminum reel-seat with solid Rosewood spacer, a premium grade Full-Wells cork grip, and cinnamon wraps. We recommend the Cortland Precision Dyna-tip trout, Platinum, and 444 Classic lines for this rod, depending on your specific casting style, species sought, and location being fished. Please call for availability.